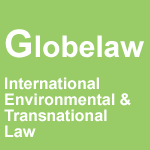 Welcome to our redesigned Globelaw website. Please let us know if there are any problems. See entries on oceans governance, oceans, arctic sovereignty and climate change, whales and biosafety liability and redress. All material can be accessed through the menu on the left. New Zealand High Court overturns GM Cattle notificaition.